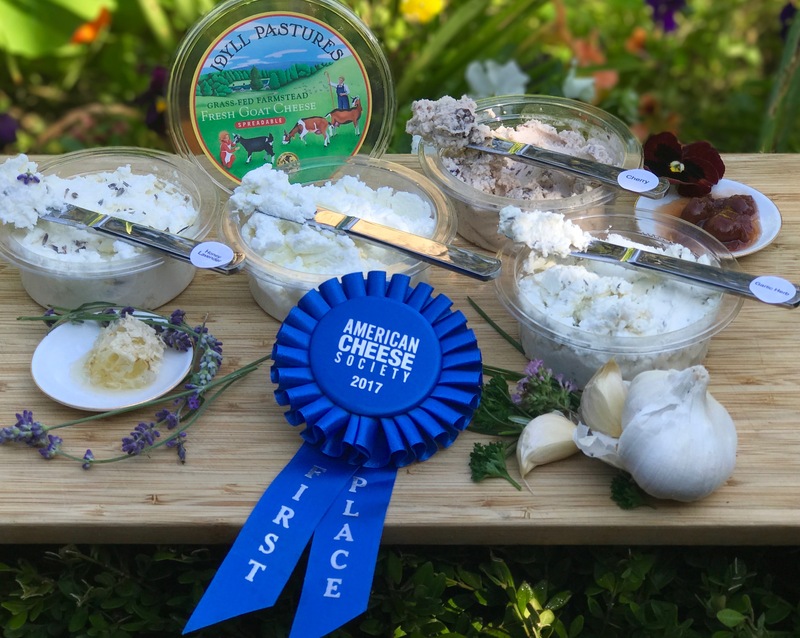 It takes only 4 days to transform Northern Michigan’s great lakes pastures into the freshest goat cheese form. The result is a fluffy, white, marshmallow-like, sliceable, rindless round with a citrusy smooth, creamy tang that melts in your mouth. Packaged with our goat logo embossed container with a longer shelf life. Pairing Suggestions: Sweet: honey, lavender, fresh fruit and berries, chocolate or Savory: olive oil, chilies, herbs, bacon jam. 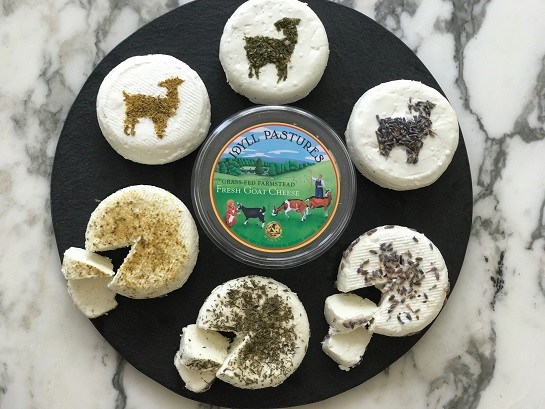 Our gateway to goat cheese. 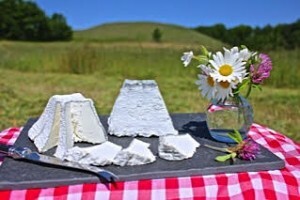 Fresh from the pastures, to the milking parlor and overnight is transformed into fresh fluffy, creamy, spreadable cheese. The most versatile cheese as ingredient for cooking, sandwiches, dips, salads, insta-appetizers on a cracker or fruit slice. Packaged with our goat logo embossed container with a longer shelf life. Mont Idyll is inspired by the traditional Valençay cheese from the Loire Valley. 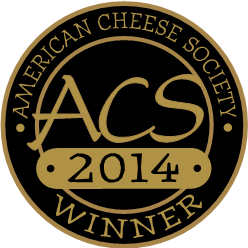 Named a “Best Artisanal Cheese” by Food & Wine Magazine. The soft ripened rind is delicately painted with vegetable ash. Fluffy, smooth and citric when young, it evolves into a firmer interior with a developed creamline under the rind as it ages. 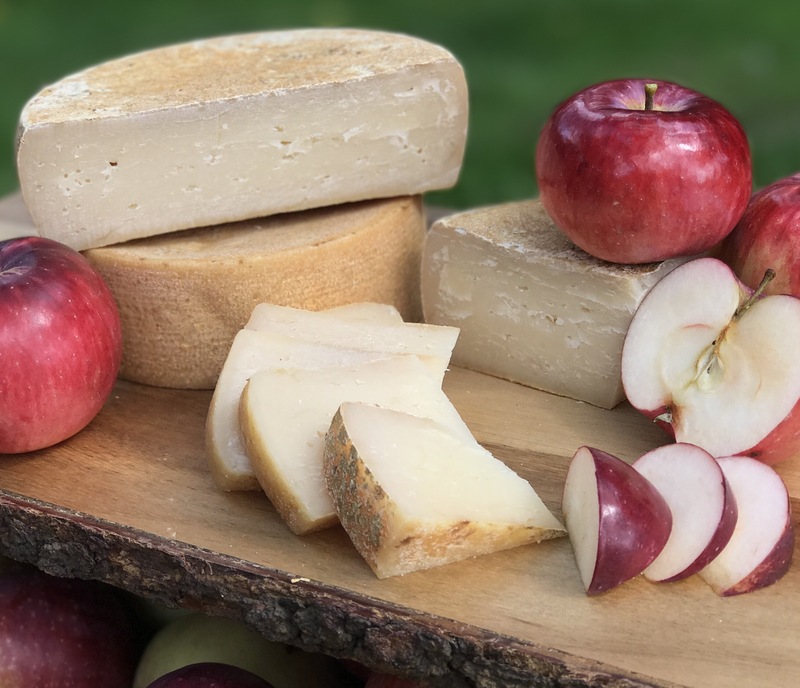 Pairing Suggestions: Sauvignon Blanc, Chenin Blanc, Dry Rose, Gamay Noir, Cabernet Franc, Dry Hard Apple Cider, Idyll Farms Cherry Butter, pickled beets or radishes, clover honey, walnuts, apple, and pear. 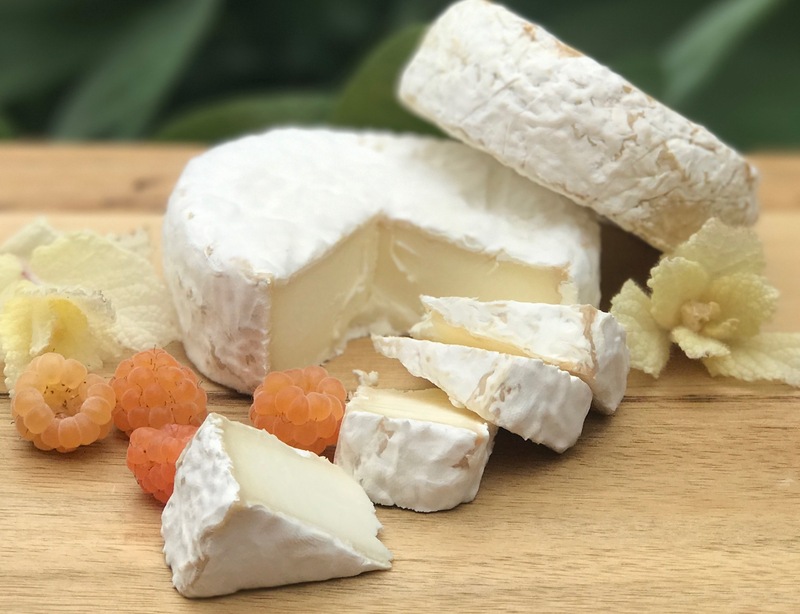 Dual milk made with Idyll Goat milk and a splash of organic cow cream, this soft-ripened round is buttery rich and creamy with a wrinkled rind. Young, it is sweet and delicate, developing a touch of heat as it ages. Pairing Suggestions: White-Riesling, Vouvray, Sauvignon Blanc, Champagne, Red- Cabernet Franc, Pinot Noir, Grenache, Fruity Hard Apple Cider, Idyll Farms Cherry Butter, quince paste, pancetta, herbal honey, chutney, bacon jam, dragon fruit, papaya, and dried apricots. Hand ladled and painted with a silvery vegetable ash and layering, Idyll Gris (pronounced “gree” French for “gray”) has a fluffy and light paste. Its taste is mild with notes of fresh cream, fruit and umami flavors, developing a cream line under the pleasingly wrinkled rind as it ages. A gold and silver medalistat the 2016 World Championship Cheese Contest, a “2016 Best Cheese” by Culture magazine and two 1st places at the 2017 American Cheese Society. Pairing Suggestions: Tart fresh white wine or a fruity and bright rosé. 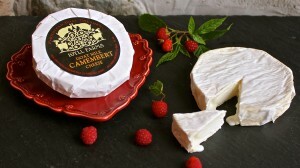 Our goat milk Camembert has quickly become a local favorite. 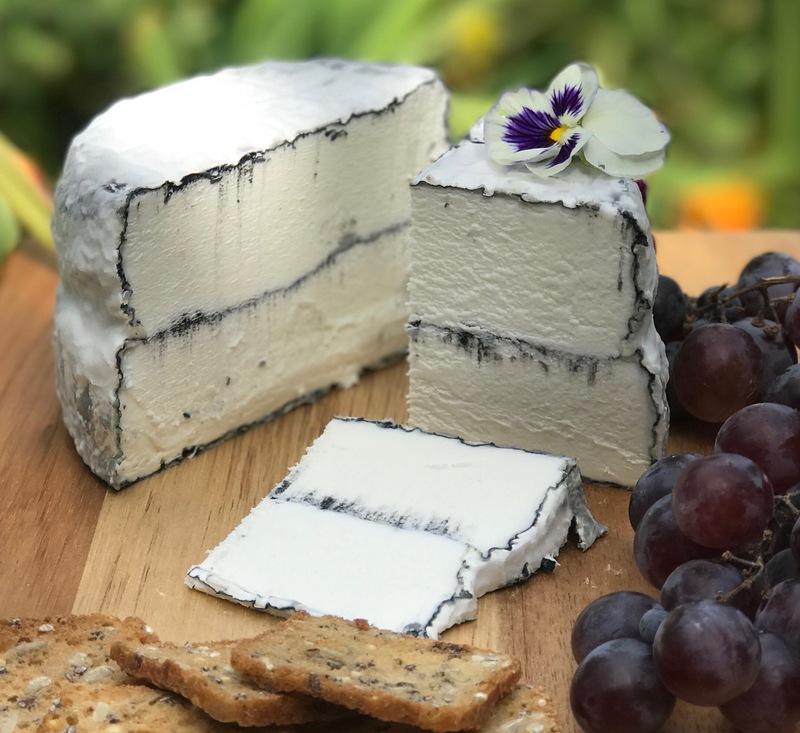 The cheese tastes as gorgeous as it looks: under the bloomy, downy white rind is a delicate, mushroomy, rich flavored paste, developing an oozy middle as it ages. Pairing Suggestions: Bold red wine and an oaky Chardonnay. Idyll Farms Cheese Knife $10- 9 3/4″ x 1 1/4″ with white plastic handle. 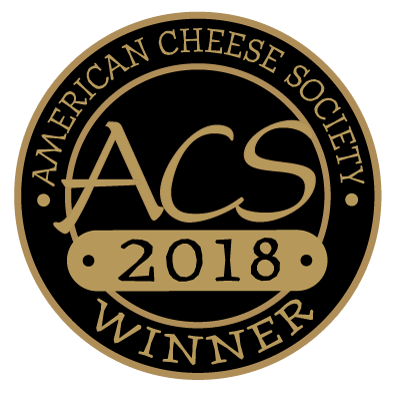 The cheese letters help with releasing the cheese and the points on the end are for serving the cheese. 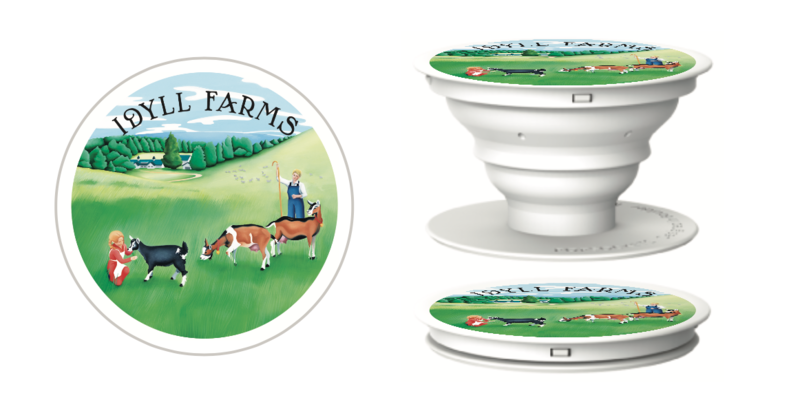 Idyll Farms PopSocket $10- This PopSocket stand allows for easy, hands-free use of your smartphone. The adhesive backing securely attaches to the back of your phone. Easily remove the stand from your phone for repositioning or cleaning. Wash the stand with water and air dry to make the adhesive strong again. The collapsible phone stand stays flat while in your pocket and expands when you need a stand. While in use, it provides a great grip while taking photos or texting. It can also prop up your phone for hands-free use! Size: (expanded) 9/16″ H x 1-9/16″ dia diameter; (collapsed) 1/4″ H x 1-9/16″ diameter. 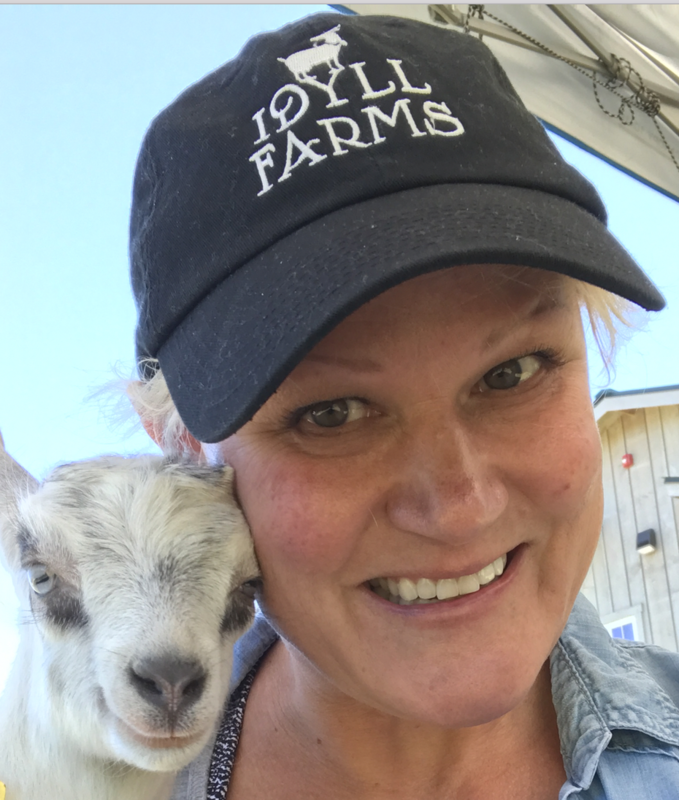 Idyll Farms Baseball Hat $15-Idyll Farms logo baseball hat with adjustable back. Made in the USA. 9 Can Cooler $15-The FlexiFreeze 9 Can Cooler is a patented design with 36 re-freezable ice cubes sewn right into the sides of the cooler to surround the contents in cold. Nothing outperforms the cooling power of natural ice. FlexiFreeze use 100% pure USA water to provide long lasting cold without the no soggy mess. 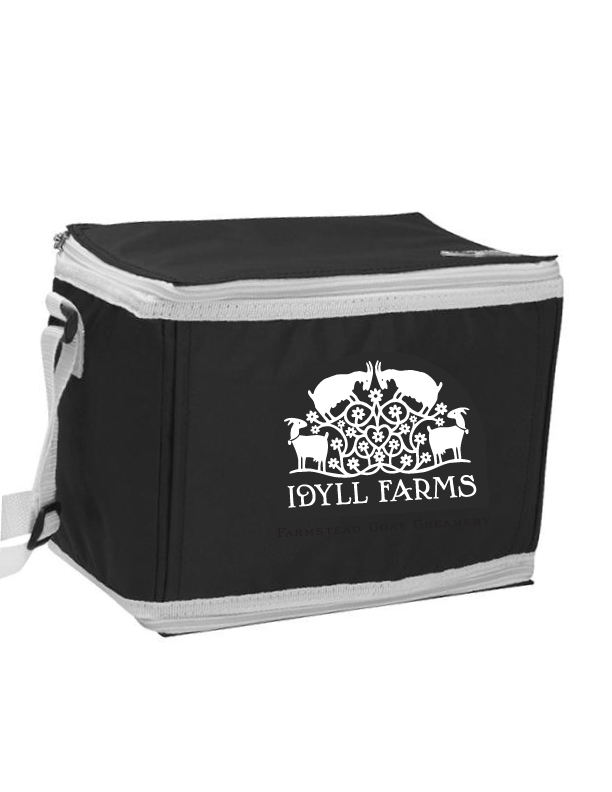 Zippers on the top and bottom of the cooler allow it to fold flat and store conveniently right inside the freezer. With the ice already built in, cooler capacity is maximized to keep more of your food and beverages refrigerator cold and safe. Say good-bye to blue goo and chemical gel packs forever. Just fold flat and store the cooler in the freezer so it’s ready to go whenever you are. Made with lead safe and durable materials, the cooler can be frozen over and over again. Freeze It, Zip It and GO!